Last weekend, one of my good friend reached a milestone birthday. Instead of entertaining a traditional dinner, I decided to host a birthday tea with some of our friends. It was a beautiful afternoon to sit in the garden with the rose garden in full bloom while sipping tea, indulging in fine pastries and catching up with friends. The tables were set with the birthday girl's favorite color (hot pink) flowers. Multiple tables were set with different china. As we all know, it is difficult being a host and a photographer. Every year, I experiment with different seeds to grow something that I have not grown in the garden before. This year, I tried Italian heirloom squash. I love the way they look in the garden and taste similar to butternut squash. This year, my Thanksgiving table will be featured around these unique squash. Today is Deepawali(festival of lights), very important religious holiday for Hindus. 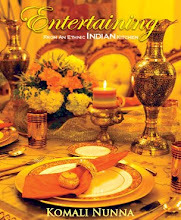 Wish all my friends, family and readers around the world very happy prosperous Deepawali to you all! This is the table from last weekend. If you notice, it uses the same centerpiece from the previous post (the original centerpiece was used at breakfast). When I want to use the same centerpiece in a different setting I change it a bit by adding or deleting to make it look different. In this case, since I am setting the table in the kitchen I incorporated Thai basil into the centerpiece. The bronze color foliage with orange dahlias adds contrast and interest. This is my last post about the garden party. My garden party ended with a sweet note: The Dessert Buffet. Your guests may not remember what they eat for dinner, but they will always remember the dessert at the party. I took advantage of the garden space and served appetizers, drinks, dinner and dessert at a different location, so that guests could enjoy the different parts of garden. Of course, my garden parties are never the same without my signature dessert: fruit tarts. 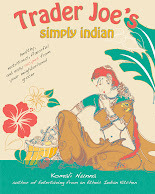 The recipe can be found in my first book, Entertaining from an Ethnic Indian Kitchen. Since there is so much color on the table and around, I kept the centerpiece to the minimum by using my favorite maiden heir fern in a beautiful container. On this table I could even have done without the centerpiece. This is a continuation of the posts regarding the garden party after the harvest, centerpieces, and garden tour. I love to entertain during summer using produce from the garden. Other than chicken, all the ingredients for the dinner came from the garden. Main focus of the dinner is garden fresh vegetables, but for a few carnivorous friends, I had to include chicken biryani. Three different kinds of rice, chicken biryani, lemon rice and beetroot rice. I love the festive colors from the garden. Lemons and beets are opulent in the garden right now. Six different chutneys and pickles were served. Chutneys and pickles are quintessential to Andhra Indian cuisine. The long squash in the background of the following picture is Italian heirloom squash from the garden.